You scream, I scream, we all scream for ice cream. We always think that making ice creams and sorbets require a ice cream machine – well at least that’s what I’ve always thought. 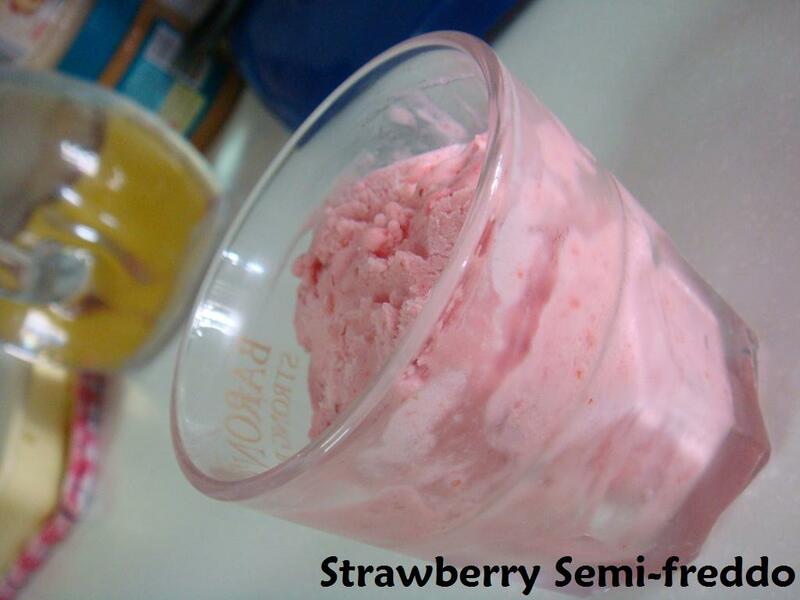 Even if I choose to make ice cream by hand, it will be pretty tedious and sometimes I am just too lazy to attempt making them – until I came across semifreddo. I first came across semifreddo a few years back, while watching one of Jamie Oliver‘s TV series. I remembered vaguely that he’s making a Praline semifreddo and I was intrigued by how it’s made as it was really simple and did not require the help of the ice cream machine. A class of semi-frozen desserts, typically ice-cream cakes, semi-frozen custards, and certain fruit tarts. It has the texture of a frozen mousse. There’s basically just a few steps into this recipe. First purée the berries then cook up the syrup. Whip the egg whites and then the cream. Lastly is just the mixing and into the freezer it goes. There is no need for the semifreddo to be taken out from the freezer to be re-beaten, which is what motivates me to make this recipe. It is a great recipe as it can be prepared well before hand and be used for last minute desserts or for unexpected guests. Commercial fruit-based ice creams often lead to wild guesses as the taste may be because of the flavouring instead of the real fruits themselves. This, is REAL strawberries and REAL taste. Process the strawberries in a food processor till well puréed. Pour the berries through a coarse strainer and extract as much liquid as possible. Beat egg whites on medium speed till foamy. Increase the speed to medium-high and pour in the hot sugar syrup into the egg whites with the mixer running. Be careful to avoid the beaters or else the syrup will splatter out. Continue beating for 10min till the egg whites are cooled to room temperature. Beat the cream till stiff peaks form. With a whisk or a rubber spatula, fold berry purée into the egg white mixture, then fold in the whipped cream. 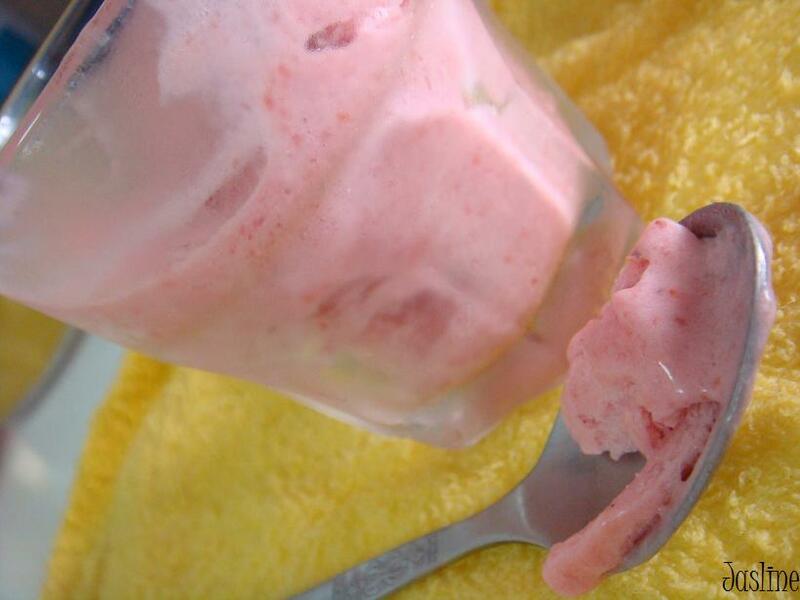 Spoon into ice cream container and spread into the corners with a rubber spatula. Cover with the overhanging plastic wrap or another piece of plastic wrap directly on top of the berry mixture. Freeze for at least 6 hours or overnight. Turn out the semifreddo onto and serving plate. Let it soften for 10min before cutting into slices and serve with additional berries.